A few years ago we took a car totally apart and learned a lot about wiring in the process. Novices tend to think of automotive electricals as a few single positive and negative wires running here and there with fuses in between. Well, think again. By the time we got our car stripped down, we had a taped up bundle of wires that wouldn't fit into the cardboard box we planned to store it in. There were several separate sub-harnesses and probably hundreds of different junction boxes, plugs, terminals and connectors, plus clips, cables, relays and switches. 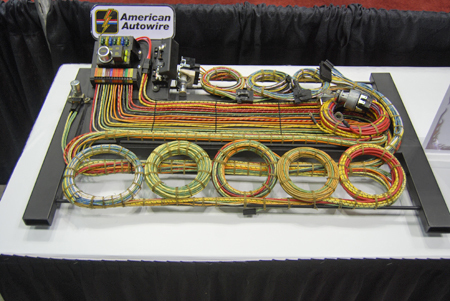 For those building '40s and '50s Resto-Mods, American Auto Wire offers its Highway 15 Nostalgia series wiring kits with braided wiring and Mega fuses. A company called American Autowire that we'll introduce you to in awhile, makes 9,000 individual parts for vintage GM, Mustang and hot rod and custom wiring systems. 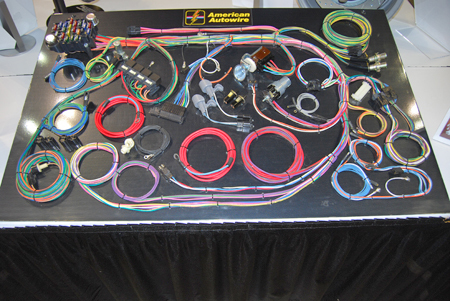 American Autowire says it has the ability to make 50,000-60,000 wiring harness combinations for just GM cars. That gives you a pretty good idea of how the "universe" of electrical wiring products is. However, everything eventually has to filtered down to the one car you're building into a Resto-Mod, with all of its factory features and aftermarket equipment. And then, you need the parts you buy to give you fault-free lights, sound, charging, ignition, etc. Don't panic. The companies that make harnesses and other electrical parts are making it easy as possible for you to wire up a car. When Jeff Noll first got his '67 Camaro, it was a little difficult to figure out the electricals, since the coupe was not a running and driving car when he bought it. He wasn't positive if all the wiring under the dashboard in the car was factory correct or not under the dash. Fortunately, things worked out in the end. Since Jeff was converting the car to the Rally Sport appearance, he did have had to purchase a new front wiring harness. It came from Classic Industries and had all the connections for the HEI distributor, tachometer, gauge sensors and for relays for the electric RS headlights. Though the Classic Industry front harness was correct, Jeff discovered that the RS dash harness also had distinctions. The wiring connections under the dash were different. This made the conversion a bit challenging, because once the new front harness was plugged into the firewall, additional under-dash changes had to be made. As we'll see in awhile, situations like this aren't an uncommon occurrence. In his '69 GTO, Jim Mokwa used an aftermarket wire harness from M & H Electric Fabricators and found it to be a very good reproduction. M & H manufactures a complete line of exact reproduction wiring harnesses, battery cables and switches for Classic GM, Chrysler and AMC muscle cars. Jim received very good technical help from M & H during his install. M & H Electric Fabricators hand assembles harnesses to OEM specs to ensure a perfect match of gauge, length, color and tape. The company also offers a kit to convert 1963 to 1972 GM vehicles with an externally-regulated alternator to use an internally-regulated alternator system. This conversion is easy to do. First, you disconnect your external voltage regulator leads and plug the M & H regulator adapter into the regulator lead wires. Then, you disconnect your alternator lead wires. Install the new GM internally-regulated alternator. Finally, plug the special $19 alternator adapter into the alternator lead wires. M & H also has a $15 harness modification that converts a 1955-1974 GM breaker point Ignition system into an electronic High Energy Ignition (HEI) system. They add the proper wires to the original type harness and leave out unnecessary wires. The new harness will still have a factory appearance, too. The install is easy, with a single wire going to the HEI distributor cap for power. As we said, American Autowire and other electrical wiring suppliers try to make it as easy as possible for you to get the wiring harness you need to fire your spark plugs and light up the road ahead of you. During an informative seminar at the Hot Rod & Restoration Show, company reps pointed out how they have developed Factory Fit products for 23 stock GM marques or nameplates, Classic Update kits for mildly modified cars and a variety of universal kits for any car. Some Resto-Mod projects can get by fine with the vehicle-specific offerings, while other cars with many modifications can still be wired up relatively simply with the Highway Series, Builder Series or Power Plus Series universal kits. Factory Fit: This American Autowire brand is made for authentic, OEM restorations where the restorer is not changing the vehicle's original power distribution system. This is aimed at pedigreed cars that get their value from being restored to exactly like new condition. These cars have no added technology or options that weren't available from the factory. They are plug-and-play systems that should install in about 10 hours, which is faster than other types since, in theory, you simply unplug the original wires and plug in the new ones. If the install is professionally done, the cost to customer should be less. These Factory Fit systems (as well as those offered by other wiring suppliers) will permit the largely hidden internal regulator and HEI conversions, if the car owner wants to do these. These factory replacement systems are manufactured to specific GM specs, using GM blueprints and molds. The colors of the wires match the original colors. American Autowire does not even include instructions with Factory Fit products, since a plug-and-play install is so simple if the builder does it the right way. The company assumes that the installer will take note of exactly how the factory routed wires over brackets and through openings. Of course, as collector car values climb, many people are restoring cars they wouldn't have touched years ago, including ones that have all the original wiring stripped out of them. This makes it hard for an installer to know the wire routings and if he or she guesses wrong, the end of the wire could wind up being too long or too short for a nice OEM appearance. In such cases, American Autowire recommends spending $25 or so for a reproduction of the GM Factory Assembly Manual. Section 12 of the GM manual will cover electricals and help the installer determine how the automaker routed the harness at the factory. 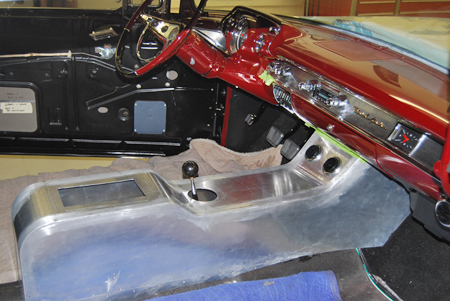 Like most manufacturers of classic car parts, American Aurtowire has a technical line that you can call for help with an install. Experts will be able to answer questions, especially when you are right next to the car so they can walk you through a fix. They will be able to look at electrical schematic drawings and tell you if a certain wire goes to your windshield wiper motor or to your horn. However, the schematic will not tell how to route the wire so its length comes out exactly right. You will need the Factory Assembly Manual for that information. In the seminar, it was also pointed out that the Ribbon Cable that serves as the intermediate body harness in many mid-'60s GM mid-size and full-size cars is not being manufactured. This is a flat cable that goes from the front of the car to the rear. The rear body harness attaches to one end and the dash harness connects to it at the front. In most cases, the car's OEM Ribbon Cable will still be in good shape. If it isn't, a substitute made by using laid-flat wires and a piece of tape will work fine, although it will not have an authentic original look, of course. 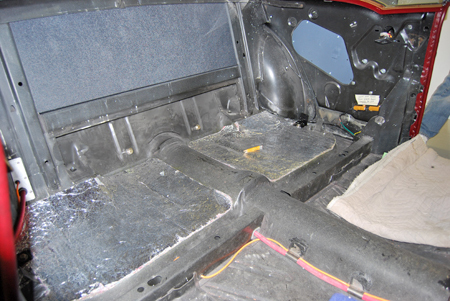 Harness manufacturers also cannot cover every last body style or option variation. For instance, mid-size GM convertible muscle cars are very rare and have special wiring for courtesy lights, power top and so on. Possibly, one in every 500 customers will need a convertible wiring harness, so that product isn't offered in the Factory Fit line. It is available as a custom option. Certain options can also require special treatment. For instance, it would require about 20-30 extra individual kits to cover all the different Mustang combinations that could have originally been had with an optional factory hood-mounted tachometer. A somewhat similar situation arises when restorers have either a stock or modified GM car they are building in which they want to use a factory air conditioning system. Even in the day, the air conditioning option usually required a separate, stand-alone factory harness to operate the various relays and controls included in the factory A/C system. The aftermarket suppliers have the standard OEM harness, but the builder will have to find all the A/C components. Most Resto-Mod builders would opt for American Autowire's Classic Update kits. This one is for the 1969 Mustang. Custom Update: For customers modifying a more or less stock vehicle from strict factory specs, American Autowire offers its Custom Update brand. This means you get an all-in-one upgrade kit in a box with everything you'll need to completely re-wire a specific year, make and model car. There are many kits available and more are being worked out and produced each year. These are very suited to Resto-Mod builds because they are based on factory fit technology, but include some $200 worth of hard-to-find components that are typically needed to add modern aftermarket upgrades to a stock vintage GM car. The Classic Update kits include a headlight switch, dimmer switch, ignition switch, boots, tubes, grommets, fuses, relays, flashers, original connectors, terminals and disconnects. You get an 18-fuse, 21-circuit fuse box system, spare circuits for power door locks and power windows, original or aftermarket taillight hook ups and the alternator and HEI conversions. Classic Update systems can also be used with either original or fully modified steering columns. Other modifications that the Classic Update kits work very well with is a dashboard fitted with cool-looking aftermarket gauges or a digital dashboard arrangement. Some builders say that using these kits is the best way to go if you want to hide the wiring more than the factory did. With all of the extras in the Classic Update kits, wire lengths can be longer or shorter than OEM lengths, but you still get the OEM style terminals and connectors that help you keep the install simple. Highway Series: This American Autowire brand (other companies have similar products) starts getting you into the custom end of the scale. These kits combine power and flexibility and are pre-engineered for custom projects. A lot of research went into developing a system capable of handling a wide range of power distribution designs that Resto-Mods may require. The Highway kits are essentially universal in nature, but still use quality components. For instance, you can select models with from 15 to 22 circuits and all of the isolate high power applications to minimize the chance of an overload. 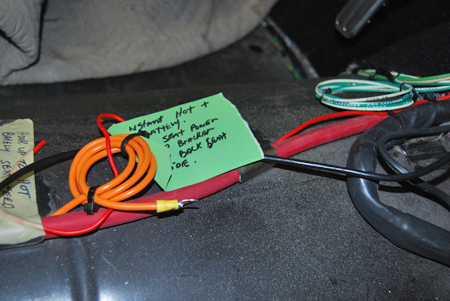 Longer coils of wire are provided, allowing builders to locate the fuse box wherever they like on the car. Each Highway Series wiring system comes with step-by-step instructions and the steps are divided into individual labeled bags. Each bag contains everything you need to complete that step. There are bags for: 1) Ignition/starter; 2) Ignition Switch Adaptor on GM Column; 3) Alternator; 4) Mega Fuses; 5) Headlights; 6) Headlight switch; 7) Turn signals; 8) Gauge panel and 9) Accessories. There is even a Highway Series Nostalgia kit, in case you want to have the braided and lacquered wire that was used back in the '30s thru '50s. The Highway Series wiring kits each include enhanced 6-gauge buss bars for a higher level of quality, a non-conductive G-10 body and a similar G-10 back plate to prevent accidental shorting or grounding caused by bad fuses or loose connections, superior 175-amp Mega Fuse protection, a screw down locking system for vibration-proof connections and full-color schematic illustrations. Builder Series: For Resto-Mods with limited space to install wiring system components, the Builder Series is perfect. These kits were designed to give big performance in a small space. You get a compact fuse box with a labeled cover that keeps moisture and other elements out of the fuse box. Despite its small size, the Builder kit uses the same heavy-duty buss terminals as the Highway Series You get a sealed ATO fuse box with integral mounting base, a headlight switch with an internal 30-amp breaker, a floor dimmer switch, a new horn relay, standard brake light connections (with provisions for a third stop lamp), a heavy-gauge main fuse panel feed wire, an indexed headlamp switch connection, a turn signal and hazard unit, circuit wiring for accessories, rear body wiring and more. Power Plus: This is American Autowire's low-end integrated fuse box system designed to serve as a very basic wiring solution aimed mainly at street rods. It offers the essentials and also includes a headlight switch and a dimmer switch. The very affordable prices start at $269 for the Power Plus 13 kit. Most Resto-Mods will be built using other products. This is primarily for basic hot rods. Modublox is the name of a line of innovative new electrical junction blocks that American Autowire created to help modified car builders such as Resto-Mod fabricators. They are designed to give builders maximum flexibility when adding the most common accessories to a car. The Modublox snap together, allowing a car owner or shop to custom build an electrical accessories panel in various ways. The modules can be snapped together in a straight line, or in an L-shape or in any other configurations. Each module comes with its own mounting bracket as well as with a red, locking wedge connector for holding the blox together. The Modublox connectors vary in size, although each one—no matter how big or small—retains the common mounting edge and dimensional integrity that allows it to be connected to other modules. The Monoblox include the same high heat and abrasion-resistant wiring as used in other products and come with full-color installation instructions. They work nice and create a good-looking system. If you are doing factory replacement wiring, follow OEM color routing. A factory assembly manual is recommended. If you are updating the factory system, the wiring kit supplier will provide an electrical schematic drawing. Even with a factory or aftermarket wiring diagram, you'll find yourself making little notes to help with your install. Attach them to the wire harness. 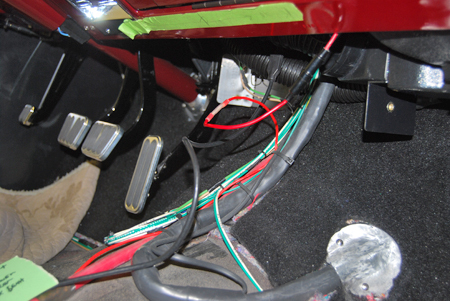 If you're using or adding a console to your Resto-Mod interior, it is going to require routing wires to in (see lower right) for lights and accessories. Wiring for the taillights and fuel sender, etc., will have to be carried to rear of the car. There may be a separate rear harness. You'll want to hide the wires. Painless Wiring makes many wiring kits. This one is for a transmission torque controller, a popular Resto-Mod item that requires laptop calibration. American Autowire and other auto wiring system suppliers have many products aimed at giving vintage muscle cars that undergo the Resto-Mod treatment as much new-car technology as possible. For instance, some products currently offered include momentary headlight switches, flash-to-pass headlight dimmers (as used on some high-end luxury imports) and courtesy light delay modules that let you to set the time courtesy lights stay on from 0 to 60 seconds. The Highway Series brand kits and all the Classic Update kits-which are the ones that appeal most to Resto-Mod builders-are now offering an option for "smart fuses" that light up if a fuse is blown. This makes it simple to find a blown fuse if some piece of electrical equipment stops working when you are driving in the dark or if the fuse panel is tucked up in a location where it's hard to reach. The suppliers make it easy to enhance the looks, functionality and safety of your Resto-Mod by offering a well thought out product line that fills every vehicle lighting need and solves every electrical lighting problem. No longer will you be driving a fast muscle machine that has 50-year-old lighting technology. You can easily incorporate Halogen "Bright Light" headlights or Ultra Bright headlights into your build or use Hyper LED OEM Style replacement bulbs in stock taillight, parking light, back-up light and turn signal housings. Colored LEDs are available for decorative use or use on cars that are used only for show. Since LEDs used all around a vehicle do not generate enough resistance to trip a bi-metal flasher can, a new low-resistance flasher can is specifically designed for use with LED lighting systems. You can also add trunk and under hood lights. 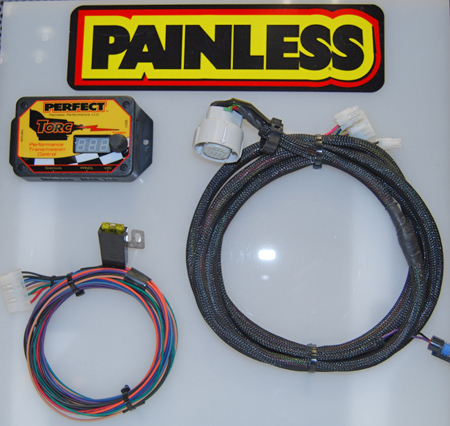 FAST makes many electronic engine management systems to wire into Resto-Mods. 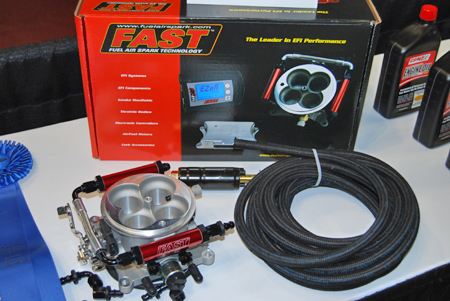 This is their FAST EZ-EFI self-tuning master kit. No laptop needed. 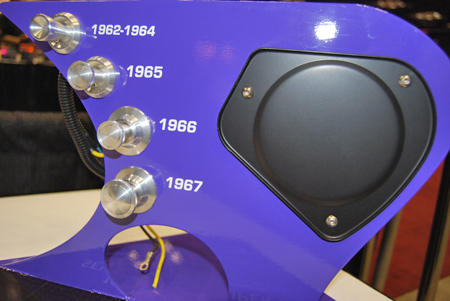 Detroit Speed designed this Selecta-Speed wiper kit for '62-'67 Chevy II/Nova Resto-Mods. It gives you high/low wiper speeds and five delay settings. Companies such as M & H Electric Fabricators, Classic Industries, American Autowire and numerous others have built Websites that are packed with information about wiring a car. Before you plan your Resto-Mod's electrical system or buy any pricey wiring kits, you should check all of the Websites to compare the features and benefits of various products, as well as prices. However, the cost of a system should not be the only factor you use in deciding which one to buy. You have to look at quality and check if a system is suitable for your car (possibly custom made for it) or simply a one-size-fits-all generic kit. On the best Websites, you can actually preview products and look at the electrical schematics. You'll read and see how the kits are produced and be able to determine which ones are designed best for your car. The Websites will tell you about ordering and shipping practices, warranty info and return policies. The American Autowire Website includes You-Tube videos (also viewable on facebook) that show you the right way to do jobs such as a safe wire crimp. Technician Don Bock demonstrates wire crimping to Sam Memmolo and Dave Bowman of the "Motorhead Garage" cable TV show. In the video, Don points out that there are two basic types of electrical terminals: close barrel and open barrel. American Autowire uses open barrel terminals made by Delphi-Packard. The wire being terminated has an insulation lane and a core lane. The end should be stripped no more than 1/4 to 3/8-inch using a wire stripping tool, not a scissors or a knife. A good wire terminal crimping tool will have a large side and a small side. The large side is used to form the terminal; the small side is used to make the crimp. With a quality tool, you do not have to use lots of pressure. If you do not have good install tools, you can order them through the American Autowire Website. You can also download Classic Upgrade kit instructions if you need a set out in the garage.